This AAA Four Diamond award winning resort sets the standard for luxury and exceptional service while surrounding you in natural beauty. Premium and Domestic Drinks Including Soft Drinks, Beers, House Wine, Liquors, Cocktails, and Coffee From 10:00 A.M. - 1:00 A.M.
Access to Gym From 7:00 A.M. - 10:00 P.M. Amenities: The Suite Deluxe room offers pool views with elegant decor. This guestroom features a king sized bed, 32-inch plasma TV, personal climate control, radio alarm clock, telephone, sofa bed, desk, mini-bar, coffee maker, safe and iron/ironing board. 24-hour room service and internet access are available for an additional fee. Kids Club for Children 5 to 12 Years Old, Open Daily From 10:00 A.M. - 6:00 P.M.
Access to Gym from 7:00 A.M. - 10:00 A.M. Amenities: The Family Suite features two bedrooms, two bathrooms and offers pool views. This guestroom features a king sized bed in the first bedroom, one king or two single beds in the second bedroom, 32-inch plasma TV, personal climate control, radio alarm clock, telephone, desk, mini-bar, coffee maker, safe and iron/ironing board. 24-hour room service and internet access are available for an additional fee. Amenities: The Suite Deluxe Premium Level features spacious accommodations with bright decor and offers superb ocean views. This guestroom features 1 king sized bed or two double beds, 32-inch plasma TV, DVD player, personal climate control, radio alarm clock, telephone, sofa bed, desk, internet, room service, mini-bar, coffee maker, safe and iron/ironing board. Use of the Exclusive Premium Level Lounge: Including an International Drinks Bar, Canapes, Continental Breakfast, Games Table, Books, Newspapers and Free Internet, Open from 7:00 A.M. - 11:00 P.M. Amenities: The Family Suite Premium Level features two bedrooms, two bathrooms and offers superb ocean views. This guestroom features a king sized bed in the 1st bedroom, one king or two double beds in the 2nd bedroom, 32-inch plasma TV, DVD player, personal climate control, telephone, desk, internet access, room service, minibar, coffee maker, safe and iron/ironing board. Amenities: 111 sq. meters. Master Suite Premium Level features room with king bed, furnished terrace, living area, front ocean view, DVD player, electronic safety deposit box, radio alarm clock, two TVs with premium channels, coffee/tea maker, mini-bar, pillow-top bed, pillow menu, hydro-massage bathtub, vanity mirror, bathrobes, slippers, iron and ironing board. Amenities: The Grand Master Suite Premium Level features modern decor and magnificent ocean views. This suite features a king sized bed, 32-inch plasma TV, DVD player, personal climate control, radio alarm clock, desk, room service, coffee maker, safe, mini-bar and iron/ironing board. 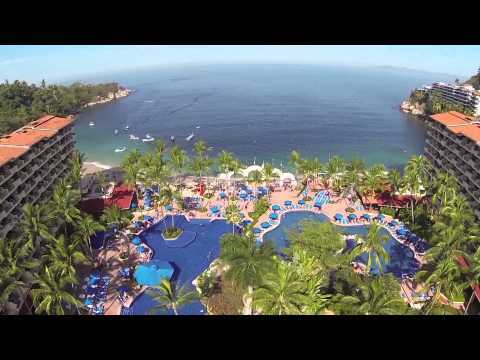 Barcelo Puerto Vallarta is located 14 miles south of the Puerto Vallarta International Airport and eight miles from downtown Puerto Vallarta. This all-suite upscale resort is nestled between the ocean and tropical rain forest just minutes from downtown Puerto Vallarta. Only minutes away from most of Vallarta`s landmarks, once you put down your suitcases, you will fully embrace your vacation and measure time by your heartbeat instead of by your watch. Barcelo Puerto Vallarta boasts five-star services, lush surroundings and Mexican-style decor. Experience golden-sand beaches, free-form pools, waterfalls and Jacuzzi`s, or get in touch with nature`s sanctuary while relaxing at the spectacular oceanfront spa. Barcelo Puerto Vallarta has invested in an ambitious beach restoration project with incredible results. Romance is always in the air since 1964 when `Night of the Iguana` was filmed in Puerto Vallarta. This all-suite resort features bright and spacious suites for up to five guests. Each suite includes a 32-inch plasma TV, personal climate control, radio alarm clock, telephone, sofa bed, desk, mini-bar, coffee maker, safe and iron/ironing board. 24-hour room service and internet access are available for an additional fee. Dining options include four restaurants, one snack bar and three bars. Los Arcos Snack Bar: Serves Light Fare including Appetizers, Ceviche, and Hamburgers. Open from 12:00 P.M. to 6:00 P.M. Pool Bar: Outdoor Pool-Side Dining with Exotic Cocktails. Open from 10:00 A.M. to 7:00 P.M.
La Cantina Bar: Offers Mexican Appetizers and Live Music. Open from 5:00 P.M. to 1:00 A.M.
All Specialty restaurants require a dress code of formal-casual. Flip flops and swimsuits are not permitted. This upscale resort features four swimming pools with waterfalls, a Jacuzzi, children`s pool as well as an adult-only pool. Relax at the U-Spa with rejuvenating treatments including facials, body wraps, massages, and beauty salon services.